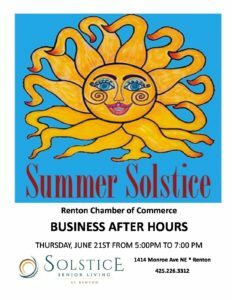 Join us as we celebrate Summer Solstice with a Business To Business After Hours at Solstice Senior Living at Renton. Come and enjoy great summer food and network with businesses that can help our seniors. We are partnering this event with our friends at the Renton Chamber of Commerce.